I made this pumpkin cake using 2 glass Pyrex bowls. I decorated it using tip 3 to outline the eyes, nose and mouth and filled those in using tip 16. I then used tip 16 to decorate the rest of the pumpkin. The stem was a Snickers bar cut on an angle and inserted into the top of the cake. I love Halloween stuff all year long! This is very cute!!!! Good job! Join in and write your own page! It's easy to do. How? 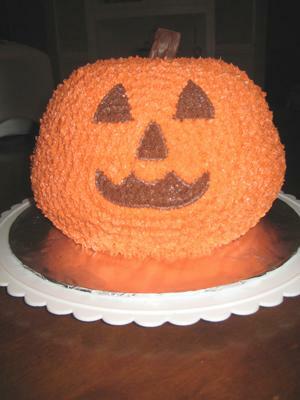 Simply click here to return to Pumpkin Cake.